Equatorial Guinea is a Central African country comprising the Rio Muni mainland and 5 volcanic offshore islands. Capital Malabo, on Bioko Island, has Spanish colonial architecture and is a hub for the country’s prosperous oil industry. Estimated population of the country in the year 2016 is about 869,587. The provision of healthcare services in developing countries has received increasing attention, but inequalities persist. The provision of healthcare services in developing countries has received increasing attention, but inequalities persist. The health care system of Equatorial Guinea is under the supervision of the Ministry of Health and Social Welfare. An overall situation points to limited medical facilities that cannot meet serious medical problems that require air evacuation to a country with modern medical or health care facilities. The pharmaceutical or drug stores in both the capital city of Malabo and Bata, where malaria is a serious concern, have only stocks of basic medicine, like antibiotics, but cannot supply advanced medication items. 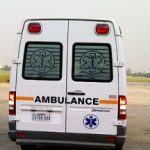 Major Causes of death, such as serious injuries, may not be currently treatable in the country, potentially due to a lack of resources and trauma care facilities. 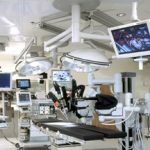 In addition, training and informational programs for both healthcare workers and the general public may not be effectively transmitting information to the intended recipients. This presents hurdles to the healthcare community, both in terms of having professional competence in healthcare delivery and in having a community that is receptive to medical care. Air ambulances are not easily accessible and seen from these locations. 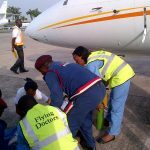 The Flying Doctors Nigeria offers Air Ambulance/Medevac services across West and Central Africa. However, our aircraft’s are based in Nigeria. 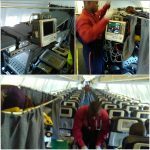 We classify an air ambulance evacuation as regional when the patient does not leave the West African/Central African region. Occasionally we use helicopters to undertake these types of transfers. 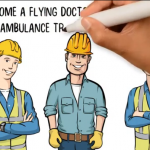 However air ambulance jets or Emergency Transport Unit (ETU, a medical cabin on commercial aircraft) is used. We have French speaking staffs that have excellent local knowledge of the area which makes language not a barrier a problem at all. Our response time immediately after an emergency call is between 90 to 120 minutes from activation time. We have our base at the International airport in Lagos and we are able to operate from Abuja International airport as well. This makes it a lot easier for us to respond quickly to emergency cases.